Volkswagen design hasn't been very exciting of late, but then again, it hasn't been that exciting for quite some time. One car that has exuded style since it was released is the Volkswagen CC, and the next generation of this fastback sedan is set to debut next month at the Geneva motor show. VW is calling it the Arteon in Geneva, but the production version we will get in the U.S. will almost certainly be the CC once again. We'll have to wait to see the whole car, but VW has released a couple of teaser images that show the grille and tail of this style leader based on what we are guessing is the next generation of the mid-size Passat sedan. The image of the front end shows a full-width grille that flows into the LED headlights and daytime running lights. The rear view shows a taillight split between the trunk and rear fender and the sloping, coupe-like rear roofline that has defined the CC as opposed to the Passat. In its press release, VW calls the Arteon a Gran Turismo, but if it is indeed a fastback version of the CC, then it is simply a stylized four-door sedan without the sportiness implied by the GT designation. We will learn more about the Arteon and by extension the next-generation CC in early March. Expect to find out more about the U.S. version, which should drop the Arteon pretense and just go with the CC name, at the New York auto show in April. WOLFSBURG, Germany — For a few years after its 2008 launch, the Volkswagen Passat CC enjoyed a respectable level of sales success in the U.S. that peaked at 29,502 in 2011, when it accounted for 9 percent of the brand’s volume. Despite a facelift and a name change to just CC, its momentum receded rapidly; in 2016, the aging “four-door coupe” was VW’s slowest-selling model in the U.S. Despite the negative trend, the automaker is staying in the segment and is getting ready to replace the CC with the bigger, better-named, MQB platform-based 2019 Volkswagen Arteon. Where the CC is about the same size as the smaller European-market Passat, the Arteon is almost the same size as the Tennessee-built Passat sold in the U.S. and the Nissan Maxima. A half-inch shorter in length than its conventionally styled sibling, the Arteon rides on a 1.4-inch longer wheelbase, and is 1.5-inches wider and 2.3-inches shorter in height. Compared to the CC, the Arteon is 2.4-inches longer and rides on a 5.2-inch-longer wheelbase; the stretch in wheelbase is entirely in the rear and allows the Arteon to provide rear passengers with an extra 0.6-inch of headroom (now totaling 37.2 inches). The Arteon’s design is a big win. Its seamless, wide-banded front grille rounds out into high shoulders and a low roofline before shooting rearward to provide a sharp profile. Big, turbine-style wheels fill the four corners, offered in 19-inches for the U.S. and 20-inches for the rest of the world. While the interior isn’t quite as striking as the swept exterior, it’s a nice, upscale place to lounge. VW’s signature gloss black surfaces and dark materials blend well with silver trim throughout the cabin. We spent most of our time in a range-topping Excellence model, where we enjoyed cushy leather seats and an option-soaked environment. VW’s new 9.2-inch infotainment touchscreen is a much-needed upgrade, and it works in tandem with the sharp Volkswagen Digital Cockpit, a near carbon-copy of Audi’s similarly named Virtual Cockpit. VW was mum on what powertrains we can expect on our shores, but did admit its newest 2.0-liter turbo-four is our best bet. In the cars we drove, the 2.0-liter put down a claimed 268 hp and 258 lb-ft of torque, but those power figures are not finalized. Europe’s Arteons will arrive with a seven-speed dual-clutch transmission managing the power, but U.S. variants will receive a traditional eight-speed automatic. The DSG-equipped model felt fast enough, charging from zero to 60 mph in what seemed like the low six-second range. With the eight-speed, the U.S. Arteon is likely to be a little more sluggish. On the Autobahn, our 4Motion all-wheel-drive-equipped tester was solid, big, and smooth — typically Teutonic. When we turned off the arrow-straight Autobahn and onto snaking German mountain passageways, it handled its bulk in a manner befitting the sleek appearance. The selectable drive modes allowed us to soften, stiffen, or smooth-out the ride and driver inputs, including steering, throttle, and shift points. When it arrives, the Arteon should start at around $35,000, much like the outgoing CC. That’s competitive with the likes of the Toyota Avalon and aforementioned Maxima, which don’t offer the Arteon’s stylish design or flexible hatchback body. While the Arteon feels and looks more premium than those two, making for a short debate, it’s also up against the likes of the Audi A4 and BMW 3 Series, which start at around the same price. The Arteon’s shapely body is its main asset against those luxury opponents as well. To get a similar profile from Ingolstadt or Munich, you need to step up to an A5 Sportback or 4 Series Gran Coupe, a roughly $43,000 proposition. For those more tempted by substance rather than badge, the Volkswagen Arteon, which can be outfitted with enough kit and caboodle to challenge those luxury alternatives, is sure to be a strong alternative when it arrives the U.S. in 2018. If that picture represents the finished product it's going to stand out as one of the nicer looking sedans on the market. What makes a car premium? There’s an argument that the badge, the price, the technology, or even the way it looks can define whether a car is ‘premium’ or not. But as a rule of thumb, it's a mix of all of the above that contributes to a car making the premium grade, or not. Volkswagen is serious about upping its premium image to take on BMW and Audi, with bosses promising that its cars will begin to look more 'emotional' – which you can take to mean more interesting. VWs make a lot of sense to a lot of people, but very rarely does someone buy one because it makes them weak at the knees. Sensible has long been the name of the game for Volkswagen. The all-new Arteon is the brand’s first attempt at cracking the mainstream of the premium market, and it gets off to a good start. It has all the right lines and curves in all the right places; its chiseled jaw and swooping roofline means it looks unlike anything else in the current product range. To say it’s the most handsome model in VW’s line-up wouldn’t be an exaggeration and even up against other stylish four-door coupes like the BMW 4 Series Gran Coupe and Audi A5 Sportback, the Volkswagen comes out on top. It’s an indirect replacement for the old CC and is based on the brilliantly engineered, but visually lacking, Passat. At 4,862mm long and 1,871mm wide, the Arteon is bigger than both the 4 Series Gran Coupe and the A5 Sportback, while a 2,841mm wheelbase makes it more spacious for those inside, too. In fact, the Arteon is actually longer and wider than the Passat with which it shares so many parts. 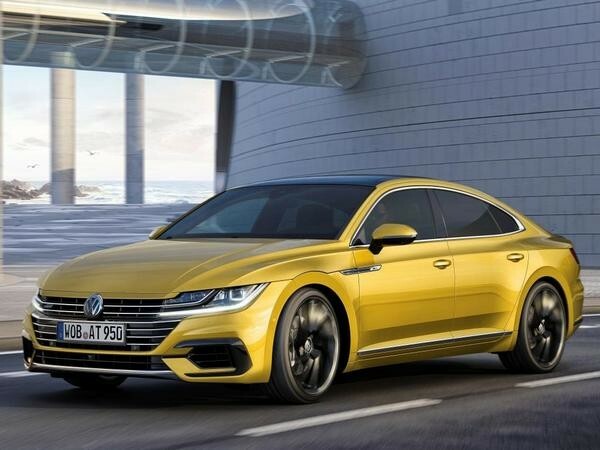 But VW wants you to think of the Arteon as a separate model and not a variant of the Passat – hence the new name, new proportions and more advanced tech. It’s based on the MQB chassis but features several new engines that aren’t available in the standard car. The first is the VW Group’s new 148bhp 1.5-litre four-cylinder turbo petrol that debuted in the SEAT Ibiza, while the other is a Golf GTI trumping 276bhp 2.0-litre. VW bosses are even discussing introducing a new high-power six-cylinder engine, too. Initially, though, VW will only offer buyers the choice between two engines: the 276bhp turbo or a 237bhp 2.0-litre bi-turbo diesel as tested here. Both feature a seven-speed dual clutch automatic gearbox and 4MOTION four-wheel drive as standard. Final specifications and prices will announced closer to the car’s launch in October, but don’t expect any change from £38,000. Depending on spec (only Elegance and R-Line trims will be offered) and with options that figure could breach the £40,000 mark. Of the two engines, the bulk of buyers are expected to go for the bi-turbo diesel. Sharing much of its DNA with the Passat, it’s unsurprising to find the Arteon feels and drives very much like the saloon - that's to say it’s impressively refined, easy to live with, and very functional. The quality of the ride, however, does come as quite a surprise. That’s not to say it’s poor, far from it. Despite riding on arch-filling 20-inch wheels wrapped in a slither of rubber, the Arteon rides with real composure and comfort, gliding over smooth surfaces. The result can be attributed to the bespoke damper system developed exclusively for this car. Potholes are its undoing, though – hit one and a noticeable thump makes its way through to the cabin. VW’s adaptive damper system comes as standard if you go for the 237bhp bi-turbo diesel, with the usual choice of Comfort, Normal and Sport modes. Normal is the Arteon’s preferred setting – reigning in the loose body control of the Comfort mode, while remaining much more forgiving than Sport. Whichever mode you’re in, though, don’t expect 4 Series levels of driver engagement. The Arteon is designed to be a stylish, long haul cruiser, not a four-door sports car. The steering isn’t brimming with feedback but it’s accurate enough, making the Arteon feel more agile than its size suggests. Unfortunately, however, our test route in and around Hannover, Germany, didn’t give us a chance to fully assess the Arteon’s dynamic repertoire. The 2.0-litre biturbo diesel is an incredibly strong motor, though, hauling the Arteon from 0-62mph in just 6.5 seconds. The combination of 500Nm of torque and 4MOTION four-wheel drive makes it doubly effective at dragging you out of slower corners and passing dawdlers on the motorway. It isn’t the most efficient, though, returning a claimed 47.8mpg – a six-cylinder BMW 430d xDrive will manage over 51mpg. On a practical level, the Arteon scores much better. The more shapely body has come at the expense of a slightly reduced boot capacity, but the 563-litre load bay is only 87 litres smaller than you’ll find in a Passat. Both the BMW and Audi can only serve up 480 litres of space. That plunging roofline has only stolen a few millimeters of headroom, too, but those over six foot will be more than comfortable in the rear. There’s also acres of legroom. While the overall cabin design and feel is on par with the BMW, the Arteon doesn’t quite match the Audi when it comes to perceived quality. The cabin is essentially a carbon copy of that from the Passat (no bad thing) albeit with VW’s latest 9.2-inch infotainment system fitted. How do you sell sedans in America today? With its new Arteon five-door fastback, Volkswagen hopes the answer is “make ‘em look good” -- and set reasonable expectations. “We know this car isn’t going into a big market,” said Elmar-Marius Licharz, VW’s mid/full-size product-line head. Considering the Arteon replaces the CC, a swoopy sedan that sold just a few thousand units in 2016, and that midsize best-sellers like the Toyota Camry and Honda Accord are off 12 and 14 percent, respectively, this year, Licharz might be understating the challenge. Style could be the Arteon’s ace, though: It’s a gorgeous car in person, long and low with wide rear flanks implying more power than the car actually has. All U.S.-market Arteons will be powered by an EA888 turbocharged inline-four engine with 268 hp, coupled to an eight-speed automatic transmission; VW’s 4Motion all-wheel-drive system is optional on the higher trim levels. As of this writing, there will be no stick shift, no V6, no DSG (for America) and, of course, no TDI diesel model. Given that the U.S. on-sale date is a year away, though, these specs are subject to change. The VW Arteon is a legitimate five-door fastback vs. a standard sedan with a traditional trunk. With its five-door hatch/fastback design, the Arteon splits the difference between sedan and station wagon. The cargo area is wide and deep, delivering far more versatile storage than a traditional trunk. Up front, the dash design will be familiar to current VW owners with its broad horizontal design line (with different accent materials available); Arteon also gets the option of a fully digital gauge cluster a la Audi Digital Cockpit. A wheelbase boosted by more than 5 inches means more rear-seat legroom, and the extended hatch helps improve headroom (more on that in a moment). When it arrives, the Arteon will be offered in three trim levels: SE, SEL and Executive; SE models get 18-inch wheels, leatherette trim, power front seats and automatic climate control, among other standard equipment. SEL adds VW’s digital cockpit instrumentation, leather seating, remote start and a sunroof. Executive models load up the luxury with a heated steering wheel and rear seats, ventilated massaging front seats, 19-inch wheels and additional electronic assists. Finally, an R-Line package will be available on any trim, offering sportier details. If a casual glance at the Arteon makes you think “Audi A7,” that’s not accidental. VW hopes its new fastback sedan appeals to a premium-car audience, and Audi’s styling flagship is a good place to draw inspiration. The flared rear haunches and clamshell hood, in particular, add dramatic flair to the sleek shape. Inside, the Arteon fixes one CC shortcoming: the absence of rear-seat headroom. With the front seat set for my 6’1” frame, I was perfectly comfortable in the rear, with ample head-, leg- and kneeroom -- not just adequate, but long-distance, road-trip comfortable. Front passengers are treated to an upscale look, particularly in the R-Design Arteon and upper trim levels with the larger touchscreen infotainment display and digital dash. It’s a great place to eat up miles, and on the road, the Arteon delivers a remarkably authentic German GT experience for its expected mid-$30K starting price point. Of course, that's partly because our testers were all German-market cars with the seven-speed DSG transmission and 20-inch wheels, neither of which will be offered in American-spec Arteons. The Arteon interior features strong horizontal design elements and good-quality materials; Elegance trim level shown. We will get VW’s unique (at least at this price) twist on adjustable drive modes: The standard DCC system lets drivers select the usual comfort, normal and sport settings, tuning the adjustable shocks and engine/steering response. But if one of those settings doesn’t deliver the desired result, fine-tuning between the main modes is possible via a settings submenu. The result is nearly infinite drive control configuration, at least one of which should do a decent impression of the Euro-spec model. On the Autobahn, drive-mode controller in normal, the Arteon feels utterly relaxed at 100 mph for extended runs; up in the Haartz mountains near Wolfsburg, drive mode switched to sport, the car proves it’s just as adept at playing in turns and cracking off passes, though some credit here goes to the DSG transmission and huge 20-inch wheels we won’t get. Still, the turbo-four provides ample push for this big liftback, all with a soundtrack that's more Ingolstadt or Stuttgart than Wolfsburg. It's an impressively quiet, composed grand tourer with amenities that should have some of the entry luxe players looking nervously over their shoulders. The new VW Arteon will be available in the U.S. starting summer 2018 as a 2019 model. If it’s as good as the German-market model when it arrives stateside next summer, the Volkswagen Arteon will hold a lot of appeal for style-conscious buyers on a budget. Will it sway folks looking for an Acura TLX or Infiniti Q50? Possibly, but given today’s crossover market, the Arteon’s biggest competitors might be the VW Tiguan and Atlas sharing its showroom space. That base model will come with more features than a lot of fully loaded vehicles. And for the car being a "turd," you should probably reexamine VW and their quality in addition to their overall reliability. Or just make baseless claims, whichever floats your boat. I will need to see it in person. It kind of looks like it just came back from a really unethical orthodontist who installed the works. Reports so far are saying only Turbo 4 power for the U.S. which would be a bit disappointing. It looks good inside and out though. It's going to have some real competition with the Stinger GT; 100 more HP for less money most likely when optioned the same. do they cheat on their reliability too? Kind of hard to cheat that seeing as to how an independent agency collects the data. 6.5 to 60 is not slow. I get it that it is relative. But by any measure to the bulk majority of the population, 6.5 to 60 is at the very least peppy. 9-10 seconds is slow 6.5 is perfectly adequate for the general populace. In something this attractive I think they could offer a more powerful engine if they have on that fits. A NA VR6 would not cut it as you wouldn't gain much HOP over the EA888. The euro car is def getting DSG, who said it wasn't? This looks really nice, definitely not a turd. Liftback is awesome too.